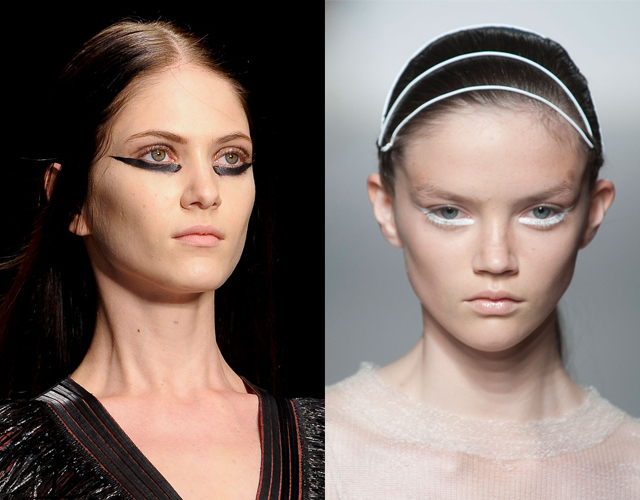 During New York Fashion Week, we saw this trend of liner being “smudged” underneath the bottom lash line. But, as us New York gals tend to do, we couldn’t leave that top lid bare, so there was either a dramatic cat eye on top as well or just a dredge of liner on the top lid. Moving into London Fashion Week, we’ve noticed that the Brits are also favoring the bottom lash, but choosing to leave the top lash line naked, making even more of a statement. This works well whether you’re using a black liner or playing with bright colors (or white)! So, obviously we’re challenging you to try the look yourselves. Above are two examples from London Fashion Week seen at Marios Schwab and Unconditional. Obviously they went a bit extreme to make it stand out on the runway, so for real life we encourage you to try a thick line drawn just along the under side of your lower lash line. Let us know what you think of the look in the comments section below, and of course what colors you tried it out in!